The German Chancellor and French President have put together a plan to boost growth. Sounds like a good goal, but what specifically are they proposing? Lowering tax rates to boost incentives for productive behavior. Reducing the burden of government spending to allow more efficient allocation of labor and capital. Cutting back regulation and red tape to boost market efficiency. But those are only obvious ideas if you want a growth plan that actually leads to…(drum roll, please)…more growth. Merkel and Sarkozy must have some other objective in mind, because they’ve proposed a plan comprised of new taxes, higher taxes, and tax harmonization. This is beyond satire. Even if I was trying to make fun of the French and Germans (perish the thought), I wouldn’t be able to make up something this absurd. Here’s some of what the EU Observer reported. Returning to Merkel and Sarkozy, the dynamic duo of statism also have some bizarre ideas on the spending side of the fiscal ledger. Here are a couple of additional passages from the story. …proposal would have 25 percent of unspent EU regional funds in countries under a bail-out program or under serious economic difficulties redirected to a special “fund for growth and competitiveness.” …As for employment-boosting measures, one of Sarkozy’s make-or-break campaign themes, the document asks governments to instruct employment agencies to make an offer to every unemployed person – be it for a job, an apprenticeship or further training. The notion that bureaucrats and politicians can boost prosperity with some sort of “fund for growth and competitiveness” is hardly worth a rebuttal. I’ll just wish them luck as they create European versions of Solyndra. The other idea, though, is worth a bit more analysis. If the article is correct, the Merkozy twins are going to wave a magic wand and direct employment agencies to make an offer to everybody. Gee, isn’t that wonderful. While they’re at it, why don’t they turbo-charge the wand and insist that all the offers be for jobs making twice the national wage. With this kind of magical thinking, it’s just a matter of time before 90 percent of the population is part of the top-10 percent. You may be thinking the previous sentence doesn’t make sense, but that’s probably because you’re one of those crazy libertarians who doesn’t understand how higher taxes boost economic performance. In previous posts, I’ve expressed some pessimism about the future of Europe. After considerable reflection, I want to retract those statements and instead say that the outlook is hopeless. If you’re reading this from Europe, get out while you still can. P.S. 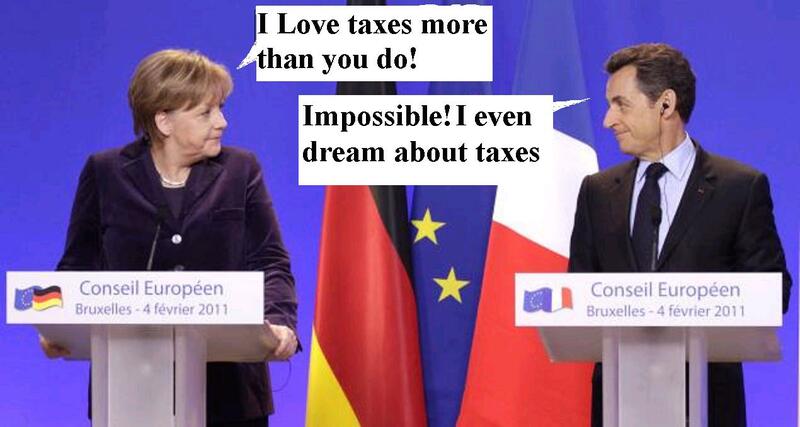 I’ve been reminded that Merkel and Sarkozy are not alone in their crazy theory that higher taxes are good for growth. The geniuses at the Congressional Budget Office have written that higher taxes are good for long-run growth, even to the point of implying that 100 percent tax rates would maximize economic performance. P.P.S. I’m further reminded that the Congressional Research Service also seems to think that higher taxes increase economic growth. Perhaps German and French spies have taken over Washington? Hello, I’m German, and I used to think that America was a better, freer place to live in. Then I learned that even in America all is not well, e.g. that people can’t drink raw milk, that the government sponsors artificial soy milk for infants or that in some places cab drivers have to have a really expensive licence. Perhaps German and French spies have taken over Washington? No, simply the American voter lemmings have hauled past Ellis island the wooden horse that came floating on a boat from Europe. One horse said “ObamaCare” and that horse has not quite spilled out its biggest “motivation and growth spurring” avatar – that will happen in 2014, when the “Relax! produce less than what would earn you over $90k per year, and someone else will pay for your healthcare” incentive to produce rolls out. But more horses are on the way…. …and as you see in Europe, these horses will be desperately needed and hanged on to destruction as the economic distress of a lower US growth trendline sets in. I’ll just wish them luck as they create European versions of Solyndra. It is indeed telling when Der Spiegel, one of Europe’s most statist publications (routinely and explicitly against American Capitalism) is finally coming to the conclusion that solar energy was a boondoggle (a predictable one as most collectivist attempts at doing something that the private market will not do for profit are). No, not yet. Tune in for this message to be promoted after Obama’s re-election in November. Things did not get to this comical point in Europe overnight. Europe is now in the resignation phase of decline, from the gospel of HopNChange. In Merkel and Sarkozy, the 🙂 European “right”, you see what the American Republican party will look like in a few years — as the American Voter buys the same, well-oiled through the centuries, hope of prosperity through statism. Europe is doomed in the predictable end of “hope that someone else will work to sustain my standard of living”, the catch-22 cycle of riding a 1-2% low motivation growth trendline to decline. Who amongst European citizens is now going to disengage from state lactation — now that things are getting ever more desperate? And will the emerging three billion soul developing world juggernaut — still comprised of people three times poorer than Europeans on average — stop their growth and give Europe some competition slack — so that Europeans have some time to finally complete their experimentation with the flat effort/reward curves of welfare state socialism? The hopes for Europe’s economic survival are comical. Europe is now set for another great crisis, the inner shell of the vicious cycle — which will start when Germans, at the margin, start going Laffer (the French have more or less already done so). There is a well established evolution to how the movie of HopNChange plays out. And every voter lemming majority before Americans loved it and bought it. So will Americans. The various incarnations of hope that “some day competent people will either be convinced, tricked, or coerced into producing for me”, always end badly for all – and will continue to do so – at least until science discovers and applies something else that leftists typically hate: genetic engineering – of the human race that is. The fine print must read “Put on ruby slippers, tap heels, and say there is no place like home”. The OZ plan would be better for their economies than their actual plan. Is it possible these fools really suggest things like this with destroying their countries in mind? Fool or villain seem like the only two alternatives for suggesting this.